Compare the best online dealer prices before you buy 2017 Canada 10 oz Silver $50 Magnificent Maple Leaves coins. The 2017 Canada 10 oz Silver $50 Magnificent Maple Leaves coin contains 10 troy ounces of silver bullion. The melt value of one 2017 Canada 10 oz Silver $50 Magnificent Maple Leaves coin is $151.10 based on the current silver spot price. The average price for 2017 Canada 10 oz Silver $50 Magnificent Maple Leaves for the past 7 days is $174.58. 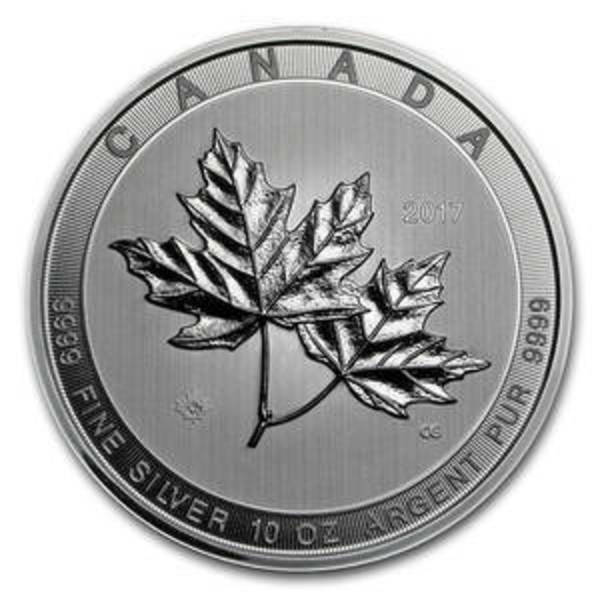 The silver Canadian Maple Leaf coin is now available in a spectacular 10 oz version. This beautiful coin merges elements of commemorative and bullion coin programs from the Royal Canadian Mint and packages it into an affordable 10 oz bullion coin. Contains 10 oz of .9999 fine Silver. Coins ship in mint capsules. Two unique features for cutting-edge security, including precise radial lines and micro engraved laser maple leaf in the coin field. Obverse: Displays Susanna Blunt’s design of Her Majesty Queen Elizabeth II, along with the $50 face value. Reverse: This striking Silver coin pays tribute to the sugar maple which is just one of several maple species that are native to Canada. The maple leaf has long been a recognized emblem of Canada. 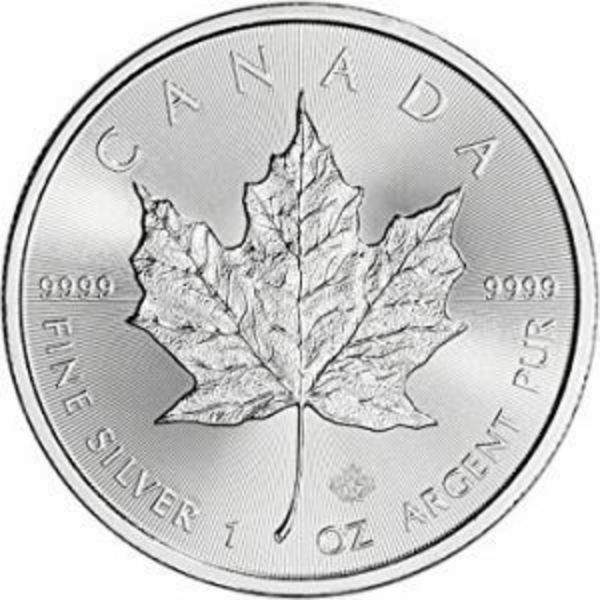 FindBullionPrices.com searches over 30 national, reputable and trusted bullion dealers to find the lowest prices on 2017 Canada 10 oz Silver $50 Magnificent Maple Leaves and other Canada Silver Maple Leaf Coins products. The prices on our site for silver bullion and coins are updated hourly and adjusted for silver spot price. We give you the tools to compare silver prices from reputable and trusted bullion dealers. Compare 2017 Canada 10 oz Silver $50 Magnificent Maple Leaves prices across bullion dealers to pay the lowest price. 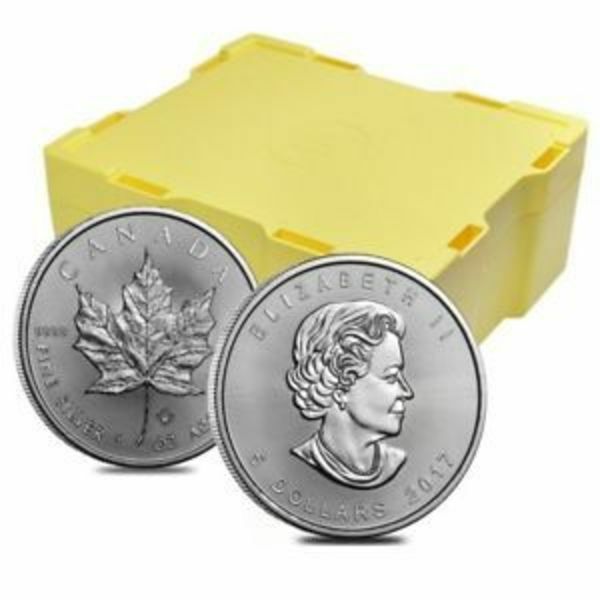 We will help you find the best prices for 2017 Canada 10 oz Silver $50 Magnificent Maple Leaves when you're ready to buy.